Today I haven’t stopped thinking of the day we came home from hospital with you as a tiny 5 day old baby. And why is that I hear you ask? You and I had been in hospital due to my silly blood pressure (which coincidentally was fine as soon as you were delivered) for 5 days after your birth on the 13th. The day came to bring you home and the snow decided to pay a visit too. Oxfordshire was covered in thick snow, which meant we only made it to my parents house instead of our home. I love this picture of you all bundled up ready to face the cold. I remember wrapping you up in a blanket and laying you down on the sofa at Grandmum and Grampy’s house. You were so tiny. I remember struggling through the snow to get home the following day, and then Daddy carrying you across the road outside our house. I remember leaving you asleep in the car seat in the living room, while all around was silent and white, and sitting staring at you, all the while thinking we were the luckiest people in the world at that very second. 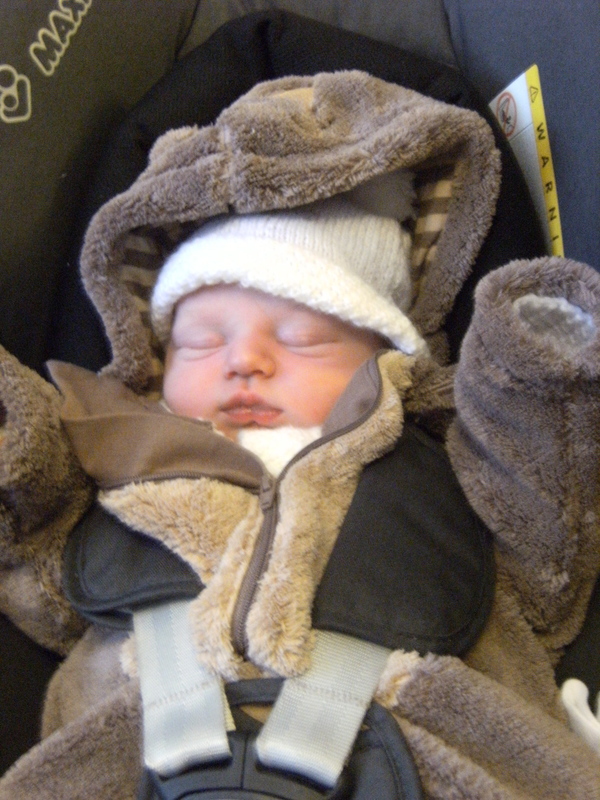 This entry was posted in Birth, Elliot, Letters and tagged Birth, Elliot, winter. Bookmark the permalink.